Barack Obama will announce during his first state visit to Britain this week that the White House is to open up its highly secretive national security council to Downing Street in a move that appears to show the US still values the transatlantic “special relationship”. A joint National Security Strategy Board will be established to ensure that senior officials on both sides of the Atlantic confront long-term challenges rather than just hold emergency talks from the “situation room” in the White House and the Cobra room in the Cabinet Office. Obama will arrive in London on Tuesday from Dublin on the second leg of a European tour that will also take him to Warsaw and the G8 summit in Deauville in France on Thursday and Friday. The president, who will stay at Buckingham Palace with his wife, Michelle, will hold separate meetings with David Cameron and Ed Miliband. • Tom Donilon, the US national security adviser, will work more closely with his British counterpart, Sir Peter Ricketts, to examine longer-term issues on the new National Security Strategy Board. Ricketts is to be replaced in the summer by Kim Darroch, currently Britain’s permanent representative to the EU. • A new service personnel joint taskforce, involving the veterans minister, Andrew Robathan, will co-ordinate work to help veterans on both sides of the Atlantic. Britain believes it can learn from the US which has an excellent track record in helping veterans settle into civilian life. The US is keen to learn from Britain’s work in helping veterans with mental problems. The new board is a rare step by the White House, which guards the secrecy of the national security council. Founded in 1947 by Harry Truman, the NSC was in 1949 placed in the executive office of the president, who chairs its meetings. Cameron tried to replicate the council when he established a body with the same name on his first full day as prime minister. It is chaired by the prime minister and designed to co-ordinate the work of the three Whitehall departments responsible for foreign affairs – the Foreign Office, the Ministry of Defence and the Department for International Development. The main discussions between Obama and Cameron will focus on Afghanistan, on which they have a similar outlook. They both aim to draw down combat troops and recognise that elements of the Taliban will have to be involved in a political settlement. Obama warned that he would be prepared to launch another raid into Pakistan, following the shooting of Osama bin Laden, if that was necessary “to secure the United States”. Jack Caravelli, an official in the Clinton and Bush administrations, told BBC Radio 5 Live on Sunday that Washington had contingency plans to undertake operations in Pakistan if a perfect storm occurred in which terrorists gained control of its nuclear weapons. The Cameron and Obama talks on Libya will be mildly less friendly. Britain recognises that Washington made clear from the outset that its military involvement would be brief. Interlocking superstates are the foundation for global governance and much like the formation of the EU, a North American Union is being created incrementally. Although there is a need for Canada to expand its trade horizons, the Comprehensive Economic and Trade Agreement (CETA) currently being negotiated with the European Union (EU) appears to be based on the flawed NAFTA model. Many view it as an opportunity to decrease its trade reliance on the U.S., but it could serve to accelerate the corporate takeover of the country. The deal would exceed NAFTA in its scope and with the third round of negotiations scheduled for April 19-23 in Ottawa, there are lingering concerns regarding its lack of transparency. A Canada-EU CETA could be used to expand NAFTA, strengthen U.S.-EU economic relations and further advance the transatlantic agenda. Some believe that the recent Canada-U.S. Agreement on Government Procurement is an important step in providing protection for future bilateral trade relations, but in the process it opens up provincial and municipal contracts to foreign corporations. Maude Barlow and Stuart Trew of the Council of Canadians criticized the Conservative government for giving up too much and receiving too little. In an collaborative article they emphasized that, “The provinces have been loath to sign the WTO’s Government Procurement Agreement and did not agree to include subnational procurement in NAFTA because they could lose too much say in how public money is spent without getting any new access to the U.S. market..” They went on to say, “We believe the Buy American controversy provided Harper and the provinces, who are actively engaged in ambitious free-trade talks with Europe, with an opportunity to restructure the Canadian economy to reduce the role of our communities in setting spending priorities.” As part of the proposed CETA with Canada, one of the EU’s top objectives includes gaining access to procurement and services in areas of health, energy, water, as well as other sectors. The Canada-U.S. Buy American deal is an extension of NAFTA and has set a precedent which could further reinforce EU demands. 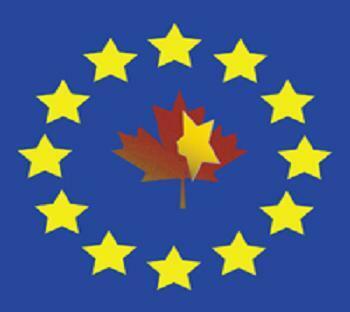 Opposition to the scope and process of Canada-EU trade negotiations is increasing. The talks have been marred in secrecy, with little disclosure on the part of the Canadian government and hardly a mention from the mainstream media. Sighting serious concerns, groups such as the Council of Canadians are calling for full transparency. They are also demanding a comprehensive impact assessment, protection for public services and procurement, along with the exclusion of any investment chapter. There are fears that a Canada-EU CETA could include provisions such as NAFTA’s Chapter 11, which gives corporations the power to challenge governmental laws and regulations that restrict their profits. NDP International Trade critic Peter Julian recently berated Canadian negotiators for using the obsolete and harmful NAFTA template. He proclaimed, “we need to push the Canada-EU negotiations towards a much more progressive fair trade model.” Julian admitted that, “It is regrettable that it seems to have been pushed aside for a NAFTA-style agreement that would decrease most Canadian incomes, encourage lower standards and lead to the loss of democratic sovereignty.” A Canada-EU CETA would further promote transatlantic ties and could later include the U.S., as well as Mexico. ATLANTA – An aviation agreement that allows airlines to operate flights more freely between the U.S. and Europe is being expanded to include more cooperation between the countries on security and ease of travel. The Transportation Department said Thursday the U.S. and European Union agreed that the terms of the 2007 pact should remain in place indefinitely. The new agreement expands U.S.-EU cooperation on safety and competition, provides greater protections for U.S. carriers from local restrictions on night flights at European airports, and includes an article on the importance of high labor standards in the airline industry. The expanded cooperation on security calls for the U.S. and the EU, when possible, to rely on each other’s security measures to a greater degree to reduce unnecessary duplication. The security efforts will include regular consultations on changes in existing requirements, coordination of airport assessment activities, air carrier inspections where possible and exchange of information on new security technologies and procedures. DOT did not immediately provide details of the night flights issue, though shipping giant UPS said it will benefit because the measure helps ensure that night flight restrictions at European airports are more consistent. Under the agreement, the policies between airports can’t be arbitrary and must be subjected to a cost-benefit analysis, UPS spokesman Norman Black said. As for the labor issue, according to documents released by the DOT, the U.S. delegation noted that labor groups in this country have benefited by having a single representative for a work group at an airline. That principle has helped promote rights for both airline flight and ground workers to organize themselves and to negotiate and enforce contract agreements. Some workers at British Airways are currently on strike and workers of at least two other European carriers have threatened a walkout. In the U.S., the Railway Labor Act limits the ability of unionized airline workers to strike. The new agreement contains no commitment to change existing statutes that limit foreign ownership in U.S. carriers and bar foreign control of U.S. carriers, DOT spokesman Bill Mosley said. Foreign ownership in a U.S. air carrier is limited to 25 percent of the voting interest in the carrier. Besides giving airlines greater access to serve other countries, open skies agreements also are a necessary step to allow U.S. and foreign carriers to form their own pacts to share costs and revenue and coordinate flight schedules. For example, Delta Air Lines and Air France-KLM have a joint venture on trans-Atlantic flights. An open skies agreement between the U.S. and Japan reached in December seeks to relax flights between the two countries. Already, American Airlines has signaled that it wants to cooperate more closely with partner Japan Airlines. A joint venture allows airlines to share costs and revenue on certain flights regardless of which airline owns or flies the aircraft. It differs from a codesharing agreement where one airline bears all the costs but another airline might get a share of the revenue for booking a customer on a flight. The DOT said the new U.S.-EU agreement was concluded after eight rounds of talks, the most recent of which included three days of talks in Brussels. A trade group for U.S. carriers hailed the expanded open skies agreement, while a trade group for international airlines said it was disappointed there wasn’t significant progress on the foreign ownership issue. The original pact eliminated restrictions on services between the U.S. and EU member states, allowing airlines from both sides to select routes and destinations based on consumer demand for both passenger and cargo services, without limitations on the number of U.S. or EU carriers that can fly between the two markets or the number of flights they can operate. Although some may have viewed President Barack Obama’s recent Asian trip as uneventful and perhaps unsuccessful, he appears to have recommitted to the principles of globalization as the answer to the world’s economic woes. Obama declared his intentions for the U.S. to be fully engaged in Asia economically, politically, and in areas of security. He announced that America would join negotiations for a Trans-Pacific deal. This could be used as an opportunity for the U.S. to reassert its leadership in regards to trade initiatives and might also serve as a stepping stone for a larger free trade agreement. While on his eight-day Asian tour, which included stops in Japan, Singapore, China, as well as South Korea, President Obama recommitted to the Trans-Pacific Partnership (TPP). It was President George W. Bush who first pledged U.S. participation in the TPP. The trade deal was put on hold pending a review of U.S. trade policy. A government fact sheet describes the TPP as a, “potential platform for economic integration across the Asia Pacific region. The United States will engage with an initial group of seven like-minded countries, Singapore, Chile, New Zealand, Brunei, Australia, Peru, and Vietnam, to craft a platform for a high-standard, comprehensive agreement – one that reflects U.S. priorities and values – with these and additional Asia-Pacific partners.” Australia will host TPP negotiation sessions in March of next year and a trade treaty could be in place by 2011. Many nations in the region are already bound by various regional and bilateral trade agreements. Expanding the TPP would further distinguish it as the only regional free trade agreement that spans both sides of the Pacific, linking Asia with the Americas. It could also gradually evolve into an Asia-Pacific free trade zone and include APEC members, as well as other nations. Such an undertaking is seen as years away, but U.S. participation in the TPP could speed up such plans. Ahead of the APEC Summit, Australian Prime Minister Kevin Rudd proposed an Asia-Pacific Community by 2020. The regional group would be based on the European Union-style model. It would go beyond APEC and encompass not only economic, but political and security issues. In October of this year, Republican Senator Richard Lugar announced his intentions to introduce legislation aimed at negotiating a free trade agreement with the Association of South East Asian Nations (ASEAN). The first ASEAN-U.S. Leaders meeting was held in Singapore on November 15. In a Joint Statement the U.S., “welcomed ASEAN’s plans to achieve an ASEAN Community by 2015 based on the ASEAN Charter, and reaffirmed its commitment to support those plans.” ASEAN and the U.S. also agreed to hold a second Leaders meeting in 2010. Dana Gabriel is an activist and independent researcher. He writes about trade, globalization, sovereignty, as well as other issues. A much-written-about transatlantic “rift” between Europe and the US on the response to the financial crisis may have been overplayed. Framed in somewhat hackneyed terms, this is the debate: the US wants to focus on stimulus – which Europeans are resisting. And the EU wants to talk about financial regulation – which the US supposedly isn’t that interested in. But in reality the two sides aren’t that far apart. Ben Bernanke’s speech this week at the Council on Foreign Relations suggests that common ground does exist. By calling for broad reforms and stricter financial regulations – not only in the US, but on a global scale – the Federal Reserve chairman seemed to sing in tune with the French and German leaders, who are trying to place the issue at the top of the April G20 meeting in London. There are certainly differences of position and perspective. The US, as the largest debtor nation in the world, would like others to help. Europe – some tend to forget – is a common market bound by a common currency, but not an economic policy decision centre. European leaders fear that talking mostly about the stimulus at the G20 would squander an opportunity to address the deep-rooted causes of the crisis. And some in the US feel that Europe should get a better sense of urgency about the recession. The US and Europe should recognize that they have plenty of common ground. Then they could take the G20 meeting seriously, work on concrete proposals and forget about scoring political points. This shouldn’t be too much to ask. Adversarial rhetoric is risky, especially in a crisis. While the “first decade and a half of globalisation was largely driven and shaped by the United States and Europe,” tomorrow’s world will be multipolar, with rising powers posing both opportunities and risks for the transatlantic economy, writes Joseph Quinlan, chief market strategist at Bank of America Capital Management, for the German Marshall Fund of the United States. His October paper argues that the transatlantic economy will remain “one of the largest and most powerful economic entities in the world in 2025,” but predicts a shift in world economic power as the figures for global output in purchasing power parity terms, currently 60% for the developed world and 40% for developing countries, are reversed. The US and the EU will both lose ground as global manufacturing output shifts towards emerging nations and their new corporate actors begin to challenge American and European players, Quinlan predicts. Moreover, nations outside the transatlantic structure will seek more influence in multilateral institutions as their increasing capital and natural resources lend them more weight. New international alignments can be expected as a result of the rise of China, India, Russia and Brazil, he observes. Globalisation is nevertheless not a “zero-sum game,” the paper recalls, warning that trade and investment protectionism would only be to the detriment of global growth. Transatlantic relations must be transformed to embrace the benefits of facilitating integration of developing countries into the global economy. Quinlan recommends that the EU and the US identify mutual interests with developing countries and step up cooperation, citing climate change, energy security and aging populations as possible areas where joint efforts would be beneficial to all parties. Developed countries should also engage China and other key developing states in multilateral organisations, including the International Monetary Fund and the World Trade Organisation, to coordinate global macroeconomic policies, he adds. Next, Europe and the US must further strengthen their partnership, as removing the remaining barriers to trade would significantly improve the competitiveness of the transatlantic economy, the paper states. Finally, both the EU and the US must tackle their own economic issues to build confidence in their economies, Quinlan concludes, suggesting that the US increases its national savings rate and reforms its social security system, while calling on the EU to reform its labour market and implement the Lisbon growth and jobs agenda. 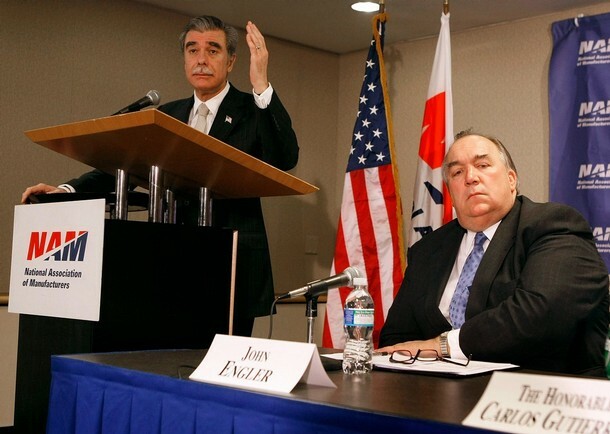 Commerce Secretary, Carlos Gutierrez (L) and John Engler (R), President and CEO of the National Association of Manufacturers, participate in a news conference at NAM headquarters April 4, 2008 in Washington DC. Gutierrez spoke about the unemployment rate for the month of March, the nation’s economic outlook and options for creating more jobs. Earlier on March 10, 2008 Engler spoke during a news conference at the department headquarters in Washington, DC. about the benefits of the Cross Border Trucking Demonstration Program, that allows U.S. and Mexican trucking companies to be able to cross the border and compete in the each others’ marketplaces. LEUVEN, Belgium, October 21, 2008 – National Association of Manufacturers (NAM) President John Engler today called for in-depth study of a “Transatlantic Free Trade Area” between either the European Union (EU) and the United States or the EU and the North American Free Trade Agreement (NAFTA) nations. In an address today to Voka, the Flanders Chamber of Commerce and Industry, Engler said that despite the rise of China, India and other emerging economies, the U.S. and EU together account for 56 percent of Gross World Product. “This gives us tremendous clout, but also tremendous responsibility,” he said. 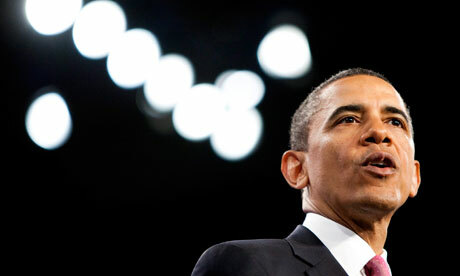 “The time has come when we should give serious thought to the Transatlantic Free Trade Area. “Rather than spell the WTO’s doom, as some might warn, a U.S. – EU agreement could jog the rest of the world into realizing that they will be left behind unless they adopt a pro-liberalization attitude and press for quicker negotiations in the WTO,” Engler said. Engler was widely touted as a potential candidate for President in the 2000 election. However, Engler quickly passed on the race and endorsed his friend, Texas Governor George W. Bush. Republican. Member of Michigan state house of representatives, 1971-78 (100th District 1971-72, 89th District 1973-78); member of Michigan state senate, 1979-90 (36th District 1979-82, 35th District 1983-90); Governor of Michigan, 1991-2002; candidate for Presidential Elector for Michigan, 1992; delegate to Republican National Convention from Michigan, 2000. Catholic. Member: Federalist Society; Jaycees; Knights of Columbus.